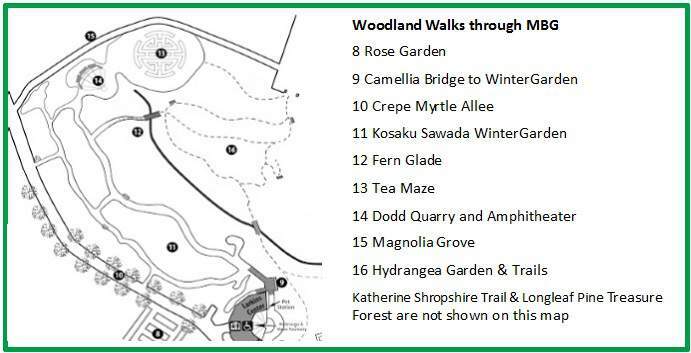 Woodland Gardens and Trails are less accessible to those who cannot walk on uneven ground. Pathways are grassed, pebbled, or rough with mulch, and visitors are asked to watch their step through these trails. Located on the left of the Crape Myrtle Allee service road the Rose Garden is an open, sunny series of beds planted with mainly Old Heritage Roses that do well in our area. Companion plants of daffodils, amaryllis, and perennials give seasonal color. 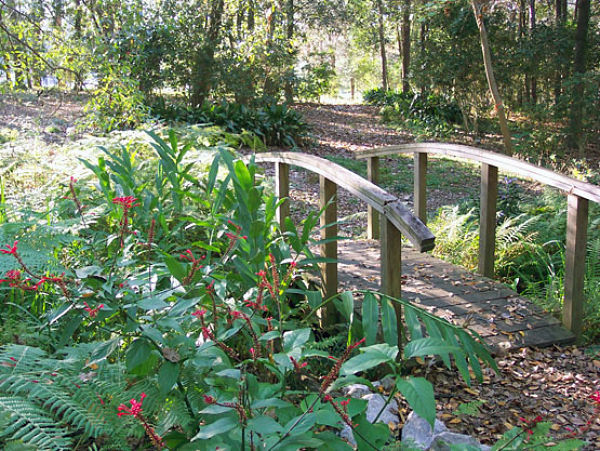 The Camellia bridge leads from the Piff Plaza fronting the Larkins Learning Center into the WinterGarden. You have a good view of the woodland area with the stream that is part of the Three Mile Creek tributary, and part of the Katherine Shropshire Nature Trail. The Crape Myrtles lining the MBG service road were planted some 30 years ago. They provide beautiful blooms and welcome shade in the summer months. With age they have deveioped trademark exfoliating bark which adds interest during the winter months. This roadway is used by authorized vehicles, but is open to visitors as an alternative walk alongside the WinterGarden. This garden is named in honor of Kosaku Sawada who immigrated from Japan in the early 1900s and settled in Mobile. His hybridization skills produced many world-renowned varieties, including “Gulf Glory” and “Tiny Princess’. See this article “Kosaku Sawada, American’ by Bill Ray for more on his life. 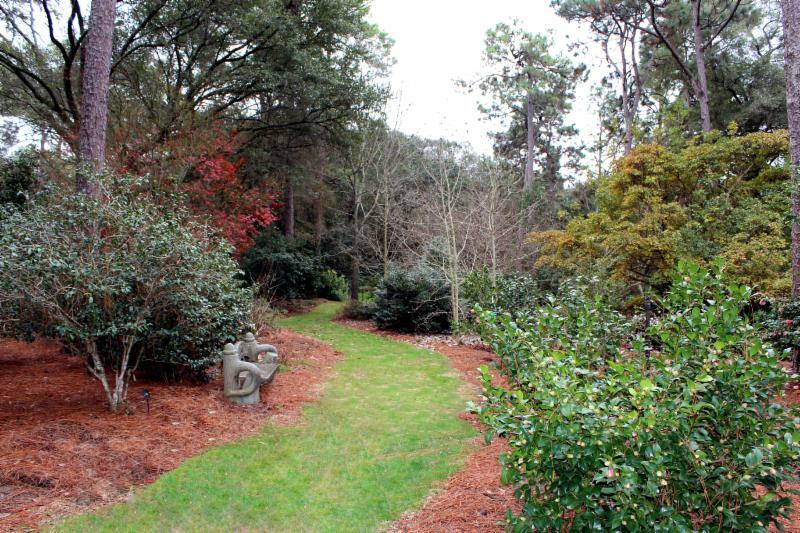 Designed by Bobby Green of Green Nurseries in Fairhope, it was completed in 2010 and was named a ‘Garden of Excellence’ by the International Camellia Society in 2014—an honor earned by only six other gardens in the USA. Building on a camellia garden planted by Tom Sawada, the eldest son of Kosaku, several decades ago, this 5 acre area now boasts over 500 new camellias, with 350 cultivars. Many are no longer found commercially , and include ‘rescue’ camellias from heirloom gardens in the Mobile Area. 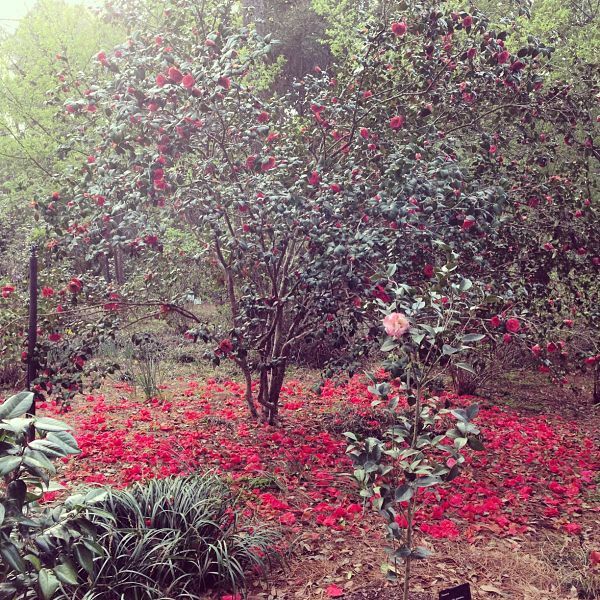 Planted along grass paths winding under tall trees, the camellia species and many companion plants give a riot of bloom from early fall into the spring—with plenty of interest throughout the year. Nestled between the WinterGarden and the wildliife trails through the woods, the Fern Glade is fed by natural springs. There are many varieties of ferns planted in the shade of the trees. Companion plants include Cardinal Spears (Odontonema stricta) and Lousiana Iris left to naturalize in this area. Tea is made from the leaves of Camellia sinensis. As tea became popular in the West, many requests went to China for tea plants. Misinterpreting the requests (perhaps intentionally) the Chinese sent flowering ornamental Camellia japonicas instead, introducing these beautiful plants to Europe and the Americas. Planted in 2012 with Camellia sinensis, the Tea Maze isn’t filled in enough to get lost in yet! It’s still fun for kids to see if they can find their way around! At the south end at the top of the WinterGarden, the ampitheater seating in the Dodd Quarry, is a great resting place, as well as a gathering area for outdoor meetings and classes. It was dedicated to honor local plantsman, William Dodd in 2010. Reclaimed materials from old Mobile were used here to create this unique feature. The large granite slabs as well as pavers and cobblestones were once part of an old graveyard in downtown Mobile. The massive decorative iron columns date to the mid 1800s and once adorned the facade of a commercial structure long since demolished. With views of the Wintergarden, woods, and Magnolia Grove, there is something to see in all seasons. Planted in the 1990s with more recent additions, the Magnolia Grove has varieties of many Magnolias, both evergreen and deciduous hybrids, planted amongst a variety of trees. This area includes a Gingko tree which turns a brilliant yellow in the fall. 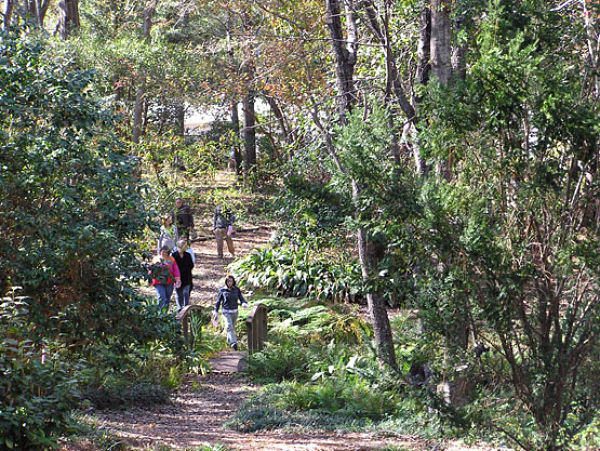 One of the earlest trails marked in the woods, this trail was dedicated to one of the Gardens’ earliest supporters in 1981. Renovated in 2014, this marked trail is a 1/4 mile walk through a wooded area. It meanders along the banks of the small stream that leads to the Three-Mile Creek. The careful observer may be treated with the sight of many different forms of wildlife as well as a wide variety of plants and trees native to our area. 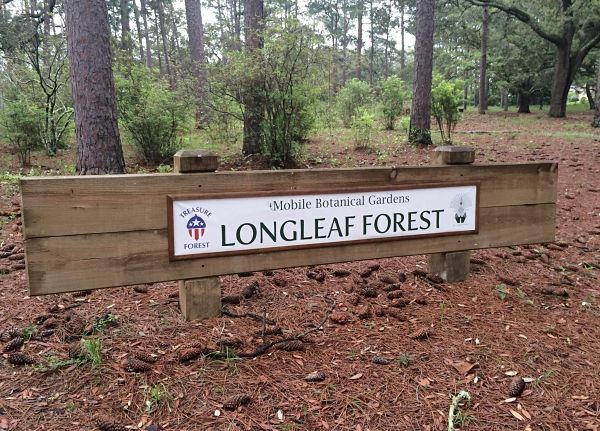 This 35-acre Longleaf Pine stand is one of the last remaining in the City of Mobile. It fronts Museum Drive at the entrance to Pat Ryan Drive. It features trails marked with OR codes for an audio tour on cell phones. Signage and markers guide your walk. Since 2005, this area has been managed using controlled burns to preserve and encourage reseeding, and eradication of invasive non-native species This has resulted in regeneration of pine seedlings, native flowers, and abundant wildlife. 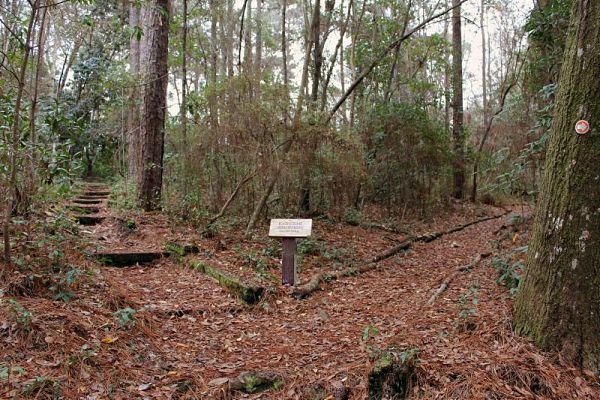 In 2010 this area was designated as a Treasure Forest by the Longleaf Pine Alliance. This ecosystem contains a vast array of 165 species ranging from giant longleaf pines and southern magnolias to tiny bluets and other native wildflowers.